On Sunday we travelled to Reading to see the Irish vs. Wasps game. This was to be our first away fixture. We didn't start as early as we'd hoped. We wanted an early start as we didn't want to miss any of the party. 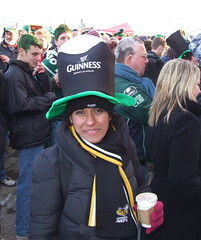 Irish were putting on a St. Patrick's event, trying to reclaim their attendance record for the Premiership. At Reading, the bus situation was not as it should be, there was a massive queue, four of five buses waiting and they loaded them one at a time (rather than simultaneously, sending the buses off as fast as possible). Just as we got near to the buses, they worked this out and everything speeded up. Arriving at the Madejski stadium we were greeted by a vast number of people in the car park, with music playing from the stage. All very pleasant, but very busy. It wasn't long before we went into the stadium though, and inside we had some Irish dancing, and Irish music over the tannoy. I know it was 'London Irish', but there was such a thing as overdoing it! Soon enough, the teams came out to warm up. We had pretty good seats, and were not far from the pitch. Though some of the big names were on International duty from the six nations, we still had people like Josh Lewsey and Lawrence Dallaglio out there. The Irish mascot made the rounds a few times, but no Sting to be seen. In the game itself, Irish took an early lead, going 10-3 up at the break. In the second half, Chris Bishay scored a great try, but unfortunately just the one. It got to 13-13, and then Riki Flutey kicked a penalty to make it 16-13 in the 75th minute. It looked at the end that Wasps may have scored a try, but it wasn't to be. In the end, alas, it was the just result, I think. It wasn't the result I wanted though! 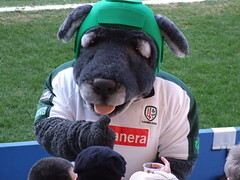 Manuel Leguizamon from the London Irish provided my highlight of the match though, and some much needed comedy. He made a break, fantastic stuff, and was clear for the line. He made a dive for the line, leaping majestically through the air.... and dropped the ball mid flight, knocking it on. This happened right in front of us, and turned Wasp anguish to humour. The Wasp players patted him on the head as he lay on the ground - he didn't look a happy bunny. After the match, Irish's coach was asked if Leguizamon would be buying the drinks, the coach replied "As long as he is not carrying them!" This was a moment that'll live on in video out-takes shows and 'what happened next' rounds of quizzes. After the match, we went round to the players' exit. We were the only Wasps there, there were a few Irish supporters. We took the view that we wouldn't hassle players and we'd let the kids get in first, so when Josh Lewsey limped past we just asked how his leg was and left it at that, Daniel Leo also went past. Alex King came over, and was very pleasant. 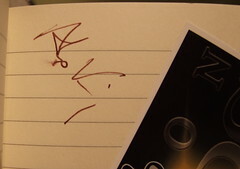 He signed my diary, and Monica took a picture. 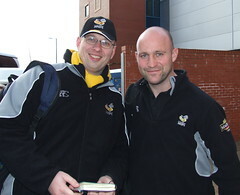 I did make an exception to the 'no hassle' rule for Dallaglio and went over. 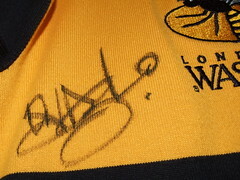 He signed my shirt, unfortunately Monica didn't take the lens cap off, and so no photo! It was getting bitterly cold, and we'd been standing about, so discretion became the watchword and we went over to the soundstage where a DJ was playing Queen numbers (messing with the speed of the song, which wasn't welcome). They were throwing St. paddies party hats into the crowd, I managed to get one for Monica, which made her look very silly. 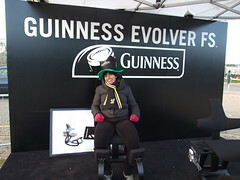 We tried out the prototype for the future seat design, the 'Guinness Evolver' - it was pretty good. On the bus on the way back, there was a rather drunk Irish 'fan' who took the tinge of the day by being quite unpleasant about the visiting supporters, it wasn't tremendously comfortable. They were singing Irish tunes all the way back, in distinctly non-Irish brogues! Another Irish supporter (an actual Irishman) was quite dismissive of them, calling them 'plastic paddies'. There were a few of these about, for example, near us in the stands was a bloke who kept standing, turning and baiting the Wasps fans. He was dutifully ignored. The Irish ground is actually the most convenient for me to get to, but given how much they play to their Irish roots it's not a team I could go along to support - I have no Irish links, and it doesn't seem right! The premiership is now has Bristol in third, Saracens in fourth and Wasps in fifth, all on 52 points. Irish are sixth on 47. Gloucester is on 59 and Leicester is on 62. 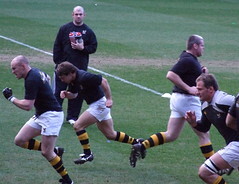 The remaining premiership games for Wasps are Saracens, Northampton and Leicester (away). To get a top four place, we really need them all to be wins. Given our good home form, and atrocious away form, Leicester will be the sticking point. The next game is against the Irish side, Leinster, at Adams Park in the Heineken Cup quarter final.